Collecting trading cards has been a great hobby for families to enjoy together. However, with younger kids, sometimes they are not all that interested in sports so parents who enjoy collecting cards have to wait until their kids get older to share the hobby with them. One thing that kids do enjoy is dinosaurs, especially boys. From books to television shows to movies, kids gobble up dinosaur content and this summer youngsters will enjoy “The Good Dinosaur” movie from Disney & Pixar and older kids will find “Jurassic World” from Universal Pictures totally polarizing. 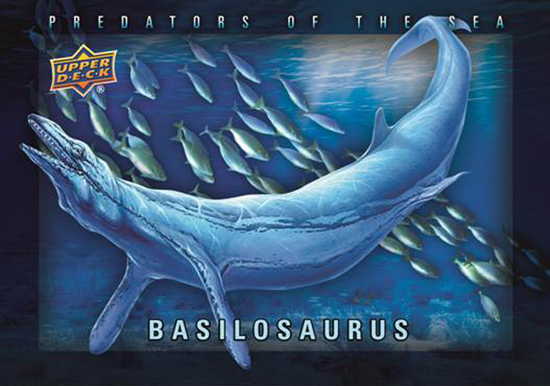 Upper Deck has produced some trading card sets that feature dinosaurs in the past that cater to youngster and the young at heart. Fans have absolutely loved them. Here’s some feedback on what collectors have thought about these dinosaur themed trading cards from Upper Deck. 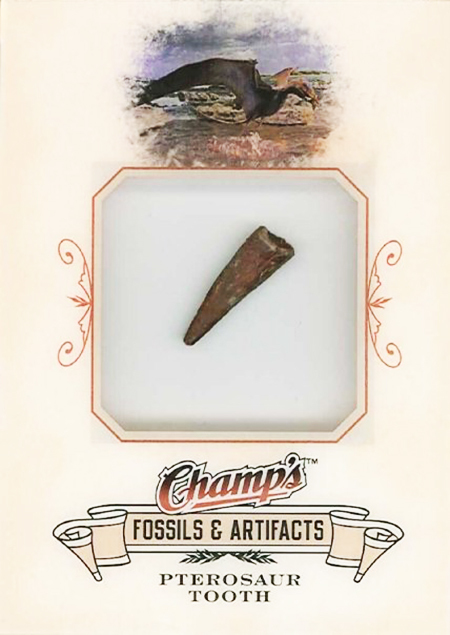 The 2008-09 Champ’s Hockey had rare fossil artifact cards that included a piece of a prehistoric fossil. 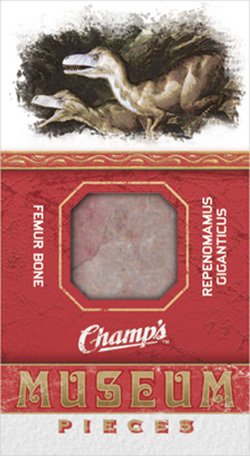 The Champ’s fossil inserts were so popular, we continued using them for the next few years. 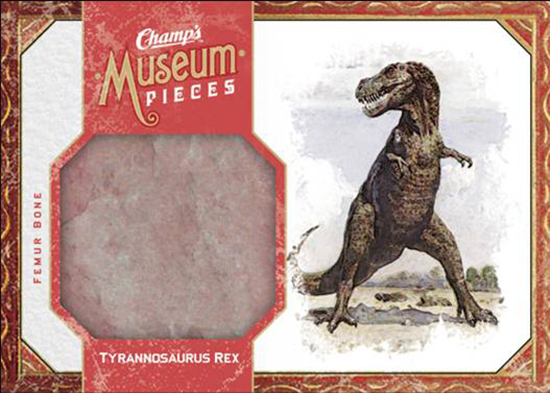 Less expensive dinosaur cards were available in Champ’s that catered to younger fans for educational purposes. 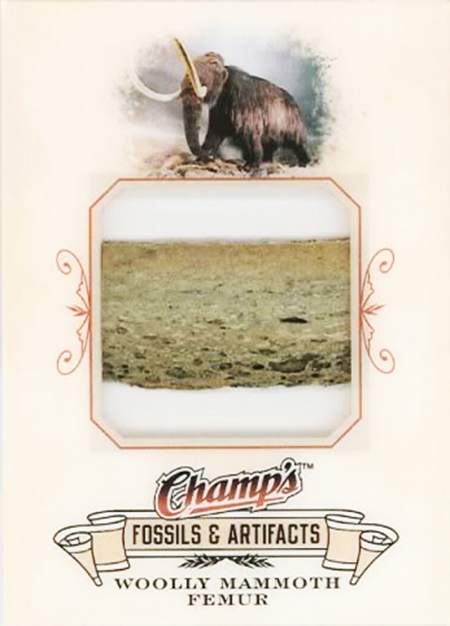 The theme for the Champ’s fossil cards was, “Where the Ice Age meets the Ice,” as these cards could be found in a hockey release. These prehistoric artifact cards were pretty rare and some sold for several hundreds of dollars in the secondary market. 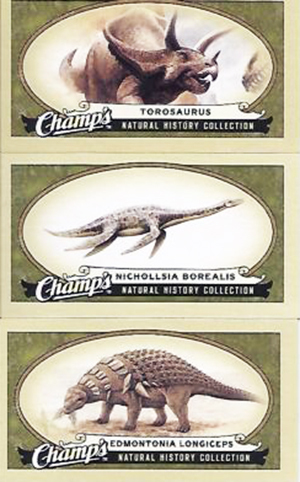 Champ’s cards that featured fossils of teeth and claws from dinosaurs were, and remain, incredibly popular. Animal Kingdom & Origins of Species patch cards in the Goodwin Champions brand from Upper Deck are incredibly popular too. This card sold for over $200! 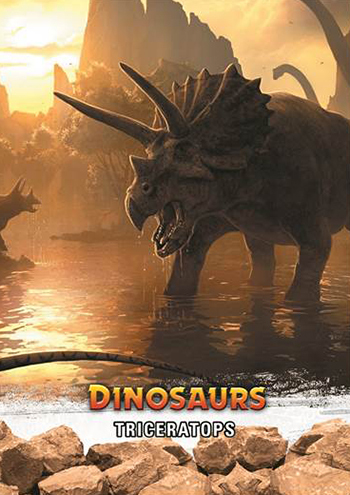 Another summer blockbuster featuring dinosaurs will come courtesy of Upper Deck where the entire set will include content from the world of dinosaurs called appropriately enough; 2015 Upper Deck Dinosaurs. 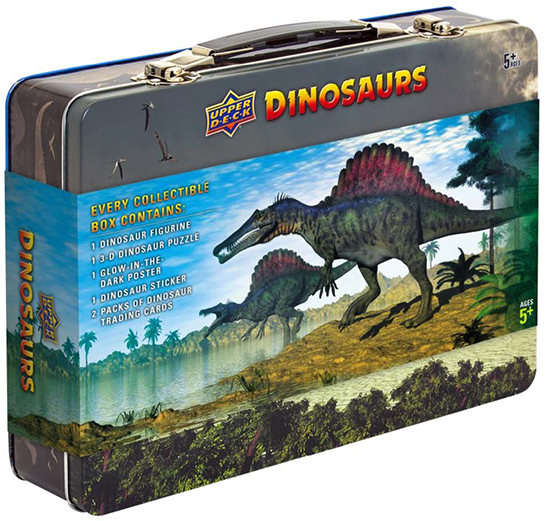 The product will have something for everyone with a version in a collectible tin catered to the youngsters and a hobby version primarily for serious dinosaur collectors. The imagery on the base cards is nothing short of stunning. Here are some of the key cards and inserts to look for from the set! 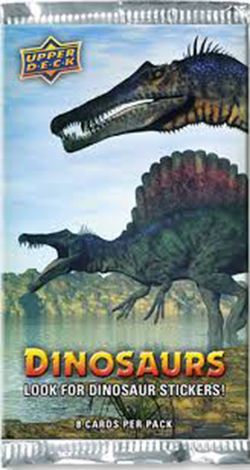 Look for incredible original art with tons of fun facts about the different types of dinosaurs who once ruled the earth. Kids will love dinosaur stickers randomly included in packs! 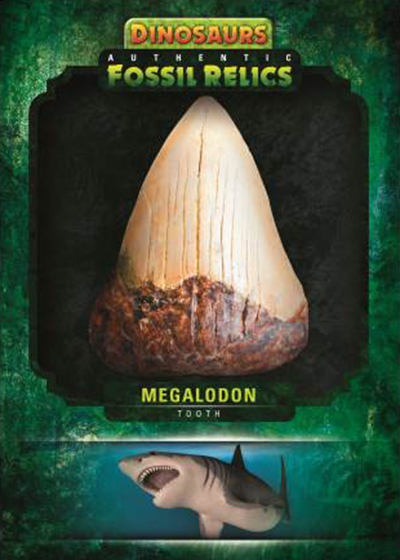 Shadowbox cards on creatures from the sea will have a 3-dimensional look. 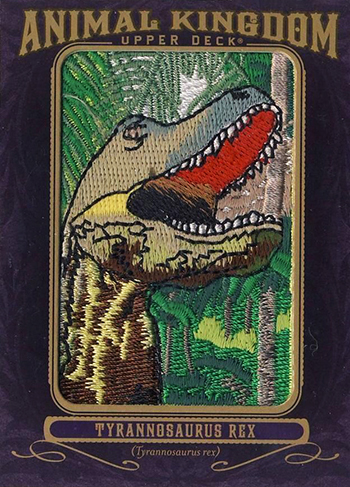 Cool patch cards for the dinosaurs are colorful and rare! Now hear this! 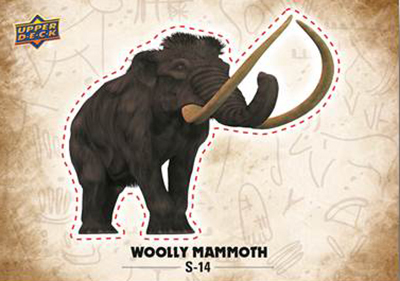 There will be booklet audio cards that feature the sounds of these ancient beasts when you open them up. 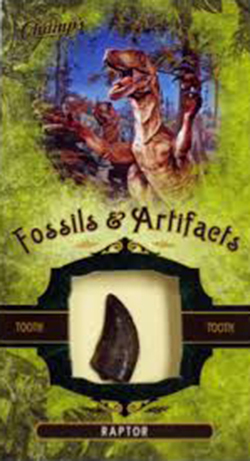 Super rare fossil cards will have actual prehistoric dinosaur fossils embedded in them. Artists are creating incredible one-of-one sketch cards that will be found in packs with different themes. These cards are designed primarily for a younger audience, but they are pretty incredible that an artist can create works of art like this on such a small canvas (a 2.5” x 3.5” trading card). 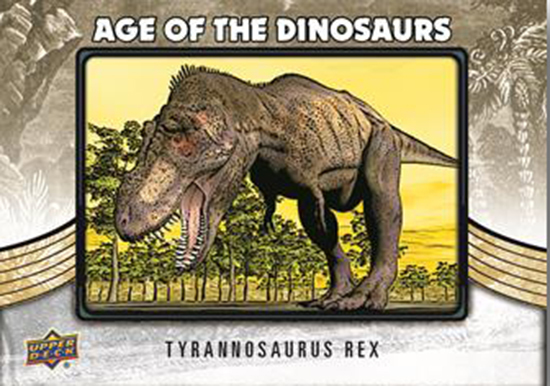 Don’t miss 2015 Upper Deck Dinosaurs when it arrives in stores in July 2015! These look great! I’m a big history buff, and while I usually tend to focus more on human recorded history, these will definitely find a place in my collection, if they aren’t prohibitively expensive. The artwork on the Triceratops card is stunning- it looks like something you’d see in the American Museum of Natural History in NYC, which has a great dinosaur display. Pretty cool, my son will love this. So scary but yet so cool and so historic.